Superfluid helium nanodroplets are one of the most gentle host system with exceptional cryogenic capability . Single molecules, molecular complexes and van der Waals clusters are readily prepared at a temperature of only 0.37 K inside these droplets. Superb heat conductivity and vanishing viscosity allows for recording MW, IR, and electronic spectra with rotational resolution. The mobility of the dopant species inside the superfluid droplets allows for studying bimolecular chemical reactions. Nevertheless, the weak interaction between dopant and droplet can be observed in high resolution spectroscopic experiments. We concentrate on the vibrational and (if possible) rotational fine structure of electronic spectra of molecules in superfluid helium droplets. Our goals are to study the interaction between dopant and host in order to learn about one of the weakest interaction forces and on microsolvation in superfluid helium and, finally, to provide details on superfluidity in a microscopic scale . The ideal conditions in helium droplets are exemplified in the spectra of porphycene showing tunneling splitting of double hydrogen tunneling for all three isotopic variants (cf. figure) . Photochemical processes such as intramolecular charge transfer (CT) or protontransfer (PT) can be initiated by electronic excitation of the molecule. Both processes are indicated by a significant frequency shift of the emission with respect to the excitation. 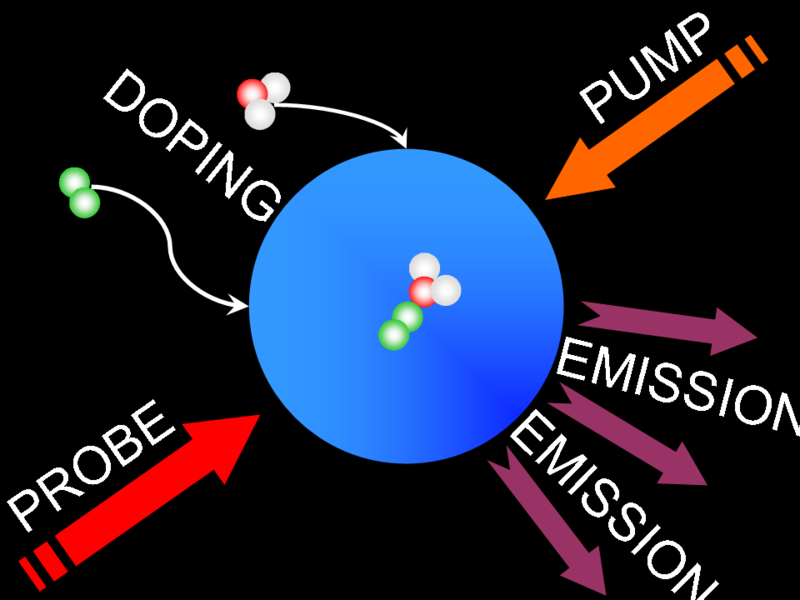 While in the gas phase the molecular system use to be hot after CT or PT, in helium droplets vibrational excitation is dissipated into the helium droplet and released by evaporative cooling prior to radiative decay. Thus, structural information of the transfer species can be obtained from dispersed emission spectra taken in helium droplets. The influence of solvent systems on the intramolecular chemistry can be studied in a molecular scale by designing complexes of well defined stoichiometry. As an example the ESIPT of 3-hydroxyflavone has been investigated and in sddition the influence of water molecules  including isotopic variants. Fluorescence excitation and dispersed emission of electronic transitions are recorded for molecules, molecular complexes and van der Waals clusters doped into superfluid helium nanodroplets. Helium droplets are generated in a continuous source and in a pulsed source. The latter was developed in our laboratory in cooperation with Uzi Even from Tel Aviv University, Israel . The first provides droplets from 103 to 107 atoms and the latter from 104 to 106. Doping is carried out by the pick-up procedure. The dopant species is provided in a heatable gas cell on axis to the droplet beam. Single particle and controlled homogeneous and heterogeneous multiple particle doping is possible. Frequency tunable laser systems in pulsed and cw mode are used for recording electronic spectra. Fluorescence detection is accomplished by photomultipliers, dispersed emission by grating spectrographs and CCD camera. 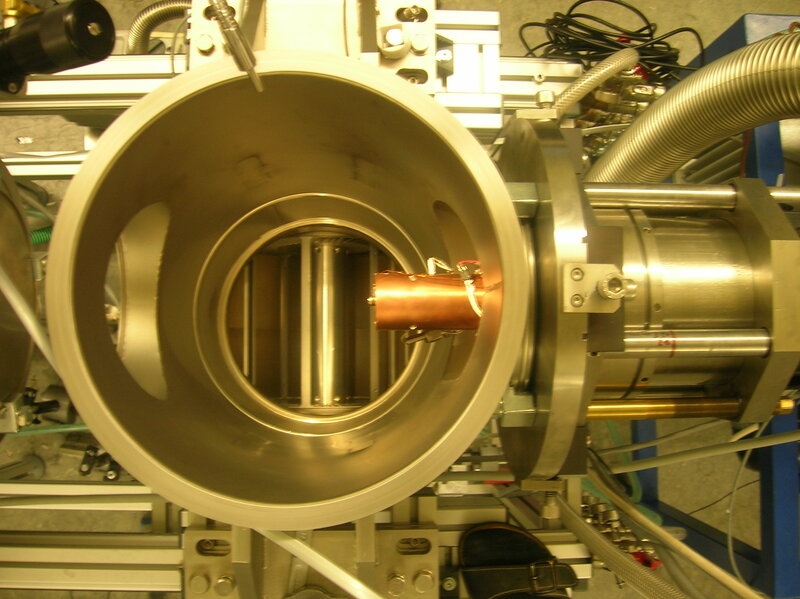 Quadrupole mass spectrometer as well as a bolometer are detectors additionally operated in the lab. in Low Temperatures an Cold Molecules, Ed Smith, I.W.M. ; Imperial College Press, London, 2008. 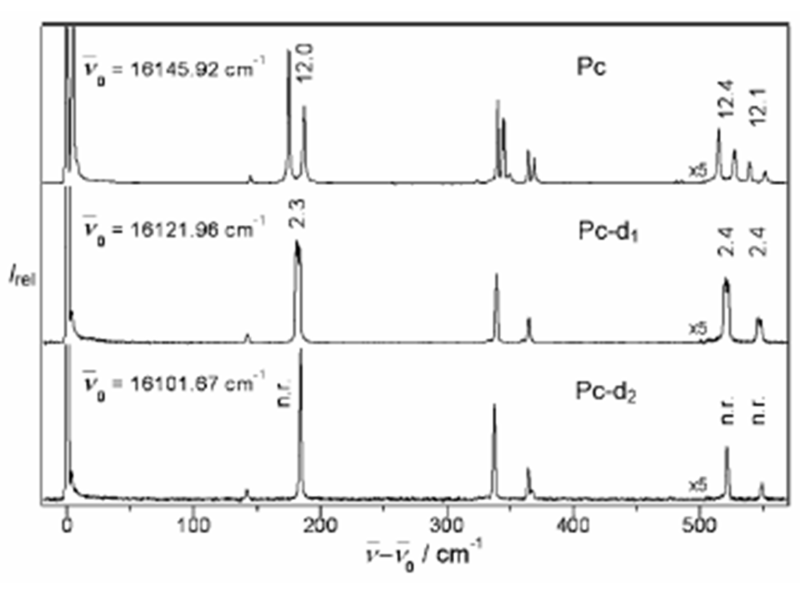 Emission spectra of free base phthalocyanine in superfluid helium droplets"
Journal of Chemical Physics" 118 (18), 8256-8260, 2003. Photochemistry of 3-hydroxyflavone inside superfluid helium nanodroplets"
Journal of Chemical Physics 131 (19), 2009.
Review of Scientific Instruments" 80 (4), 2009.